Ahhh January! Mine and many other peoples least favorite month of the whole year! It’s dreary, holiday bills are coming due, and those ten pounds of “holiday merriment” are giving me a nice muffin atop my jeans. Eating better in January is hard because most of us want comfort food, but still want to detox from the holiday gluttony. So this dish is a quick, healthy, and comforting way to serve comfort to your friends or family. 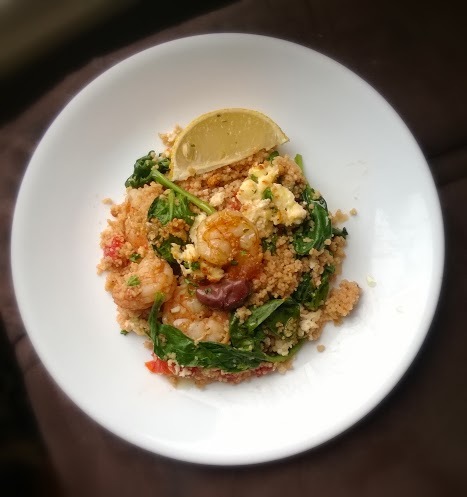 Using couscous, spinach, and shrimp makes it quick, and a bit of feta and tomatoes makes it delicious. ¼ Cup Kalamata olives, haved. 1 pound good quality large shrimp, peeled and clean, at whole foods they have some great ones that are cleaned for you! 2 cloves garlic, sliced “Goodfella’s” style, if you haven’t seen the movie, you should, but just slice them as thin as possible. 1 cup diced tomatoes, canned works fine, just use a good San Marzano variety. 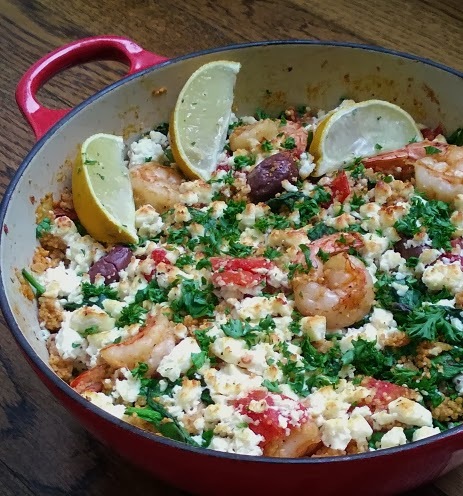 In a medium skillet or thick bottomed pot, heat olive oil over medium high heat, add shallot and garlic, cook three minutes, add shrimp seasoned with a bit of salt and pepper, when first side turns pick flip and, add tomatoes, oregano, and white wine. Cook for a minute or so then add 1 cup of water and ½ teaspoon of salt, when boiling add olives, couscous and spinach, stir, cover, remove from heat. After five minutes remove cover and top with crumbled feta, you can put it under the broiler at this point to melt the feta (optional but tasty), chopped parsley, and squeeze of lemon, serve! This dish is awesome because not only is it easy, it is cooked and served in the same pan, elegant enough for guests and done in 20 minutes! Halloween is only three days away and I wanted to make sure I got another “spooky” food idea up before the season is over. I love beets, I have many a post dedicated to them and here is one for Halloween. Fun enough for the kids and still sophisticated enough for adults this recipe is a win, win. I got some amazing loose beets from Chuck’s over the weekend, they were huge, local, red beets the size of a softball! I roasted mine whole, which ended up taking about three hours! You can easily roast your beets ahead of time and refrigerate so you they will be ready whenever you need them. 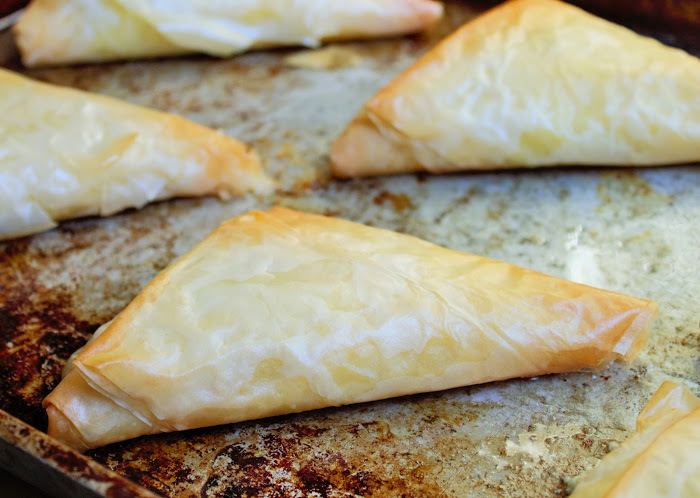 Aside from the roasting time this recipe is super fast and simple. 1 large beet (softball sized) you could use two smaller ones but they might be a little harder to decorate. 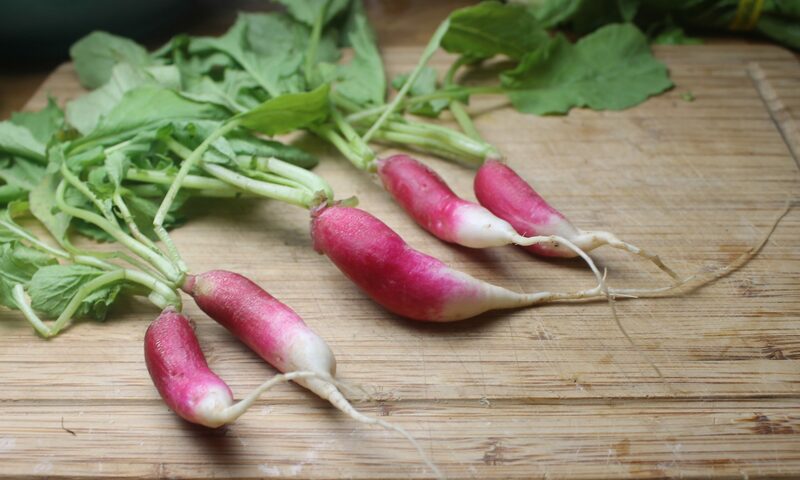 a few handfuls of salad greens, arugula, spring mix, whatever you like. Heat your oven to 375 degrees, stab beet a few times with a fork and wrap whole in aluminum foil, roast about three hours or until easily pierced with a fork. Cool a while then peel, while beet cools, in a blender place feta with cottage cheese and blend until smooth and whipped up, refrigerate until ready to assemble. Slice beet into four slices, in a bowl whisk olive oil and vinegar together, add greens, salt, and pepper. Distribute dressed salad evenly over four plates, top each with a slice of beet, and using a ziplock bag with a hole cut on one end or piping bar, pipe ghosts on and top with pepitas for faces. 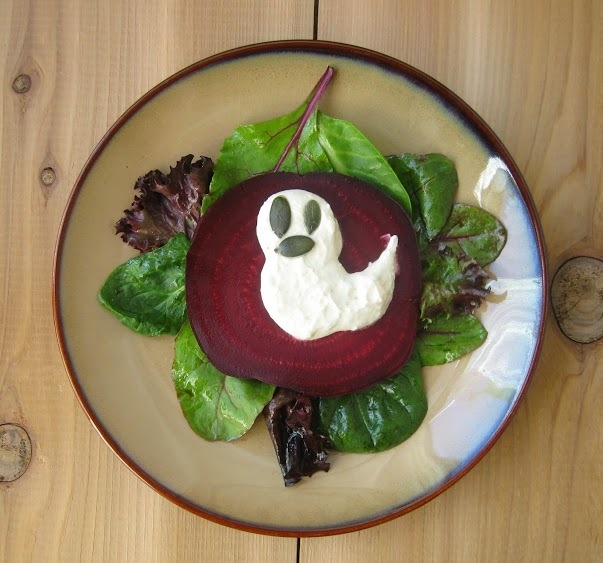 Enjoy your Halloween with this fun salad!